Take your outdoor entertaining space to the next level with the Pendleton Creighton Sectional with Lounge Chair and Fire Table by OW Lee. This set seats five in comfortable deep seating furniture that can be easily rearranged to fit your space. OW Lee has combined the intricate patterns of Pendleton fabrics with performance of Sunbrella outdoor fabrics to create a timeless style that will impress the most discerning customers. 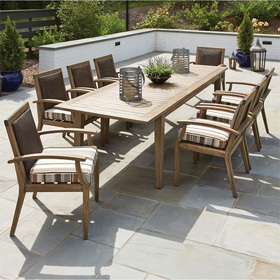 The centerpiece of this set is the Pendleton Creighton Fire Pit Table guaranteed to provide your patio with lasting heat and light. This set is completed with an end table and four pillows for added comfort. This set comes in select colors with free shipping. Lifestyle Photo: Shown in Mill Cloth Midnight Fabric, Coastal Grey Finish. Urban Effect Table Top Tile. Right Sectional Chaise 58.75"W x 31.75"D x 37"H N/A lbs. Center Sectional 35.75"W x 30.75"D x 38.25"H 73 lbs. Left Sectional 35.75"W x 30.75"W x 38.25"H 74 lbs. Lounge Chair 36"W x 36"D x 19"H 164 lbs. Table 18"W x 18"D x 24"H 35 lbs. Fire Table 18"W x 18"D x 24"H 35 lbs. Pillows 15"W x 6"D x 15"H 3.4 lbs.